THE OLD AND THE NEW BLACK HOLE. 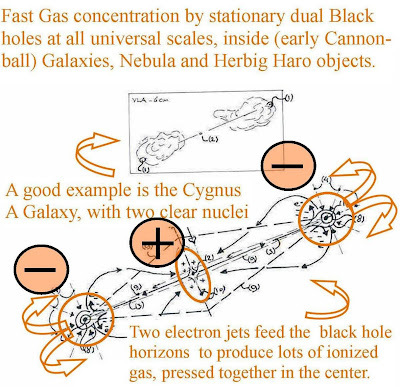 All Black Holes seem to be able to create ionized gas around a Fermion repelling Black Hole horizon. 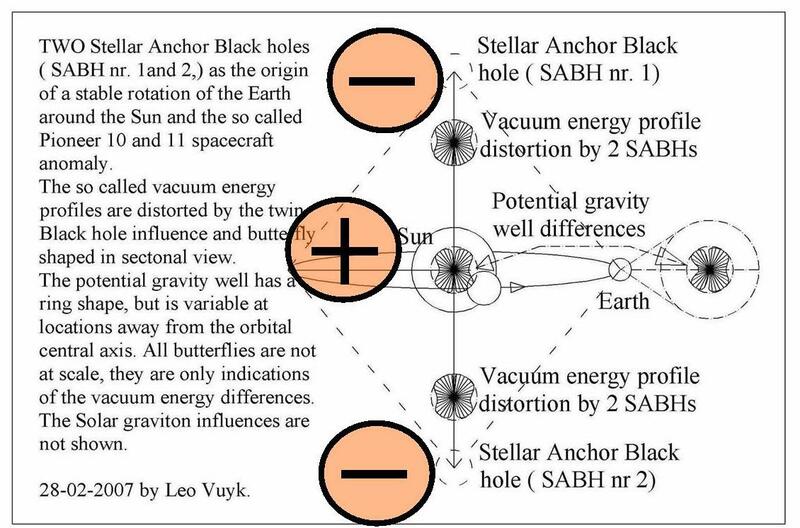 As far as we observed untill now, there seem to be four different kinds of Black Holes based on their different creation and sizes. 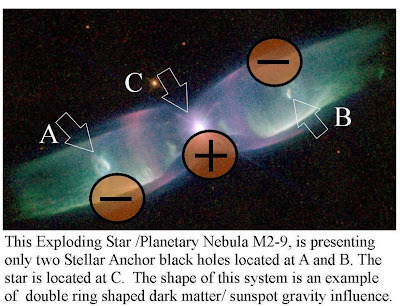 1: Micro Black Holes, formed by strong interference of X-ray-Electromagnetic photon based radiation. They are observed as Ball Lightning, different sized Comets, Sun grazers and Sunspots. 2: Supernova Black Holes formed by the implosion of Stars. 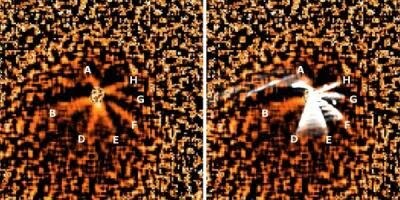 They are observed as double Herbig Haro (H-H) objects inside millions of Nebula like the Eagle and Crab nebula. 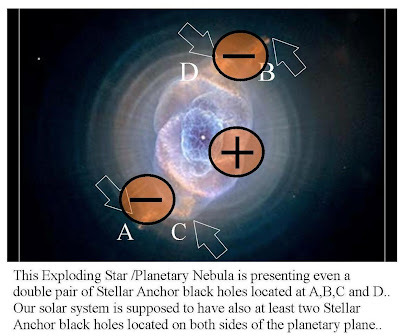 H-H objects are supposed to be the accelerators of star formation in open star clusters inside Nebula and coined Stellar Anchor Black Holes (SABHs). 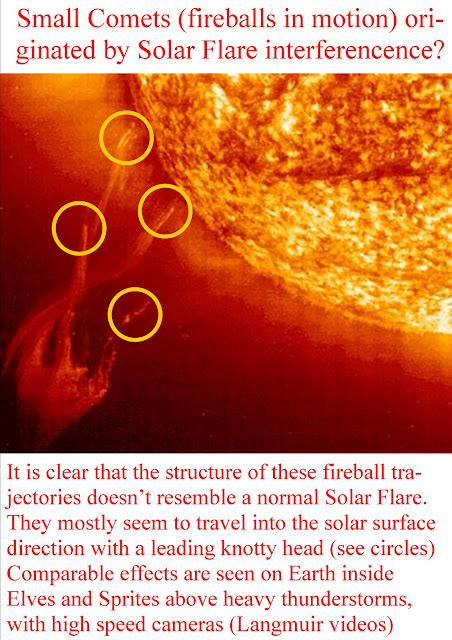 Our Sun is assumed to be the remnant of an open star cluster, still accompanied by its dual H-H objects. 3: Primordial Big Bang Black Holes, formed by the explosion or evaporation of the Big Crunch Black Hole. 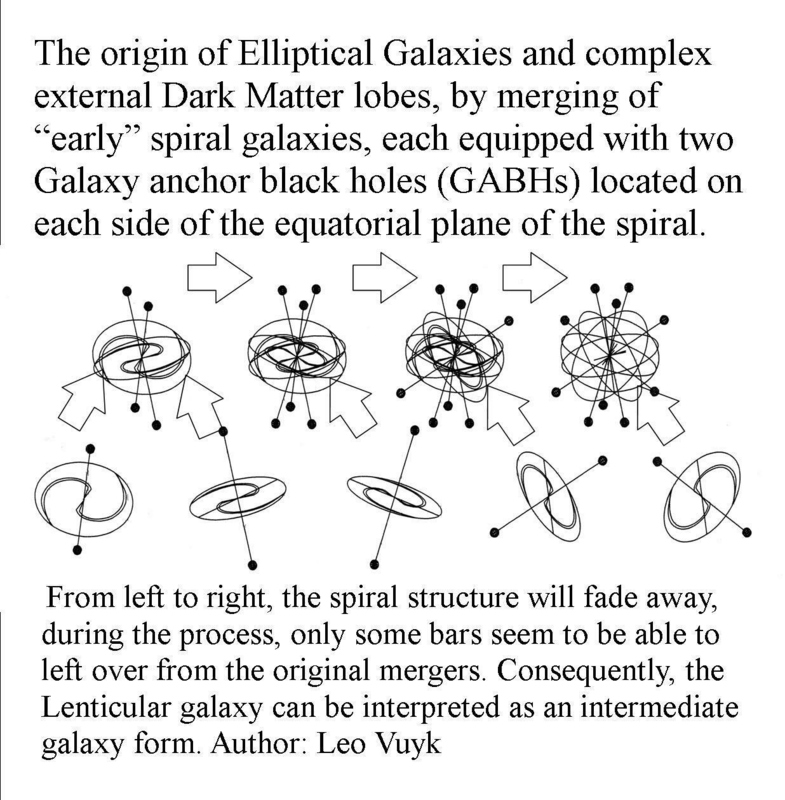 They are assumed to be the accelerators of Galaxy formation and coined: Galaxy Anchor Black Holes (GABHs). 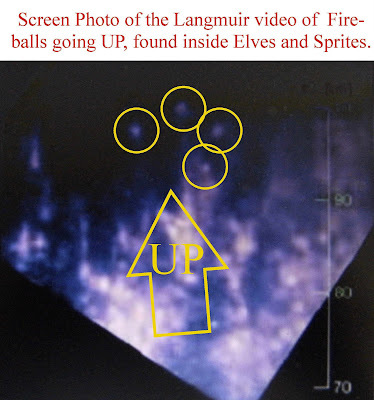 They can be observed as clear dual x-ray sources. 4: Big Crunch Black Hole, made by the merging of the contracting content of the pulsating (multi) universe. The "vacuum lensing butterfly structure" of the Higgs vacuum pressure, in combination with the propeller shape of Fermions, is the base for Fermion repulsion by Fermion SPIN FLIP, see below. 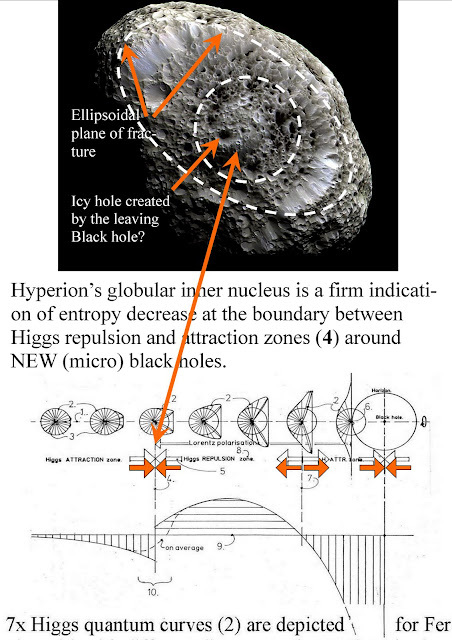 Hyperion is interpreted as a former Comet, abandoned and left alone by its former nuclear micro Black Hole. 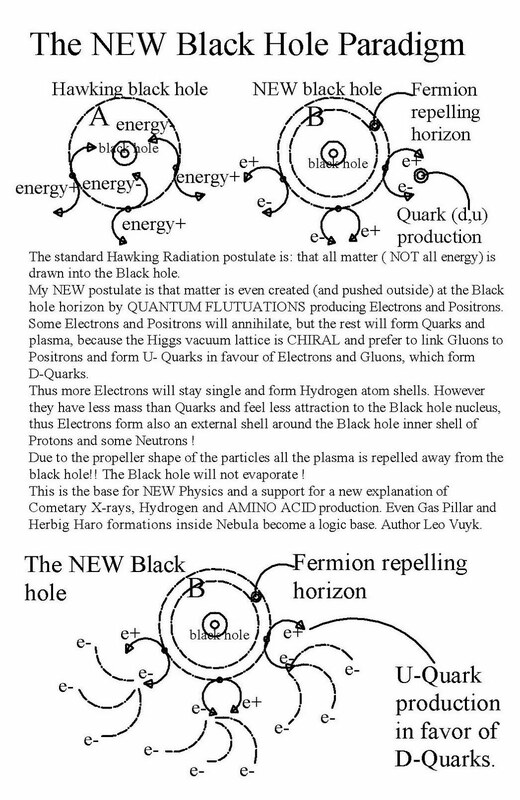 Zero Point Energy ZPE related to a new Black Hole Paradigm, the motion of a pebble and the fate of Schrödingers Cat. 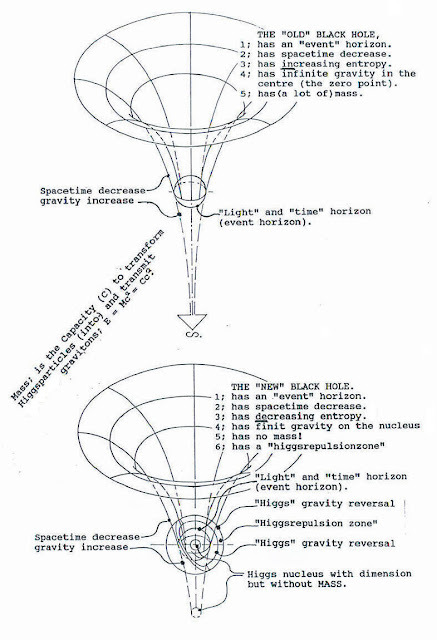 1: That Black Holes have NO capacity to produce and radiate Gravitons, as a consequence, they have NO MASS! 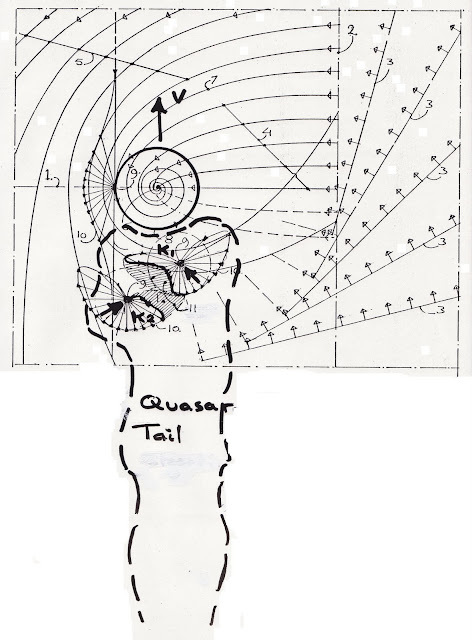 2: That there is an opposing vacuum deceleration force on the pebble, which is in equilibrium with the continues acceleration forces produced by the same vacuum (on the 'quantum mechanical level]'), to explain everlasting continuing motion in a straight line. 3: That this line can be curved due to local differences of the oscillating Higgs vacuum and this line can even flip 180 degrees in the neighbourhood of a Black Hole ( Higgs-virgin repulsion ). 4: That the pebble should be conscious about its speed and direction of motion! 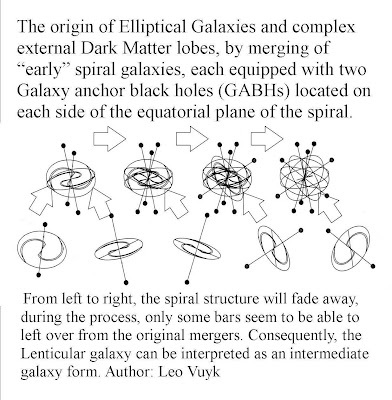 5: That the symmetric Multiverse entanglement at a distance could give us the answer about consciousness. 6: That as a consequence we live inside one of a dual set of CPT (Charge Parity Time) symmetric (Multi) universes which are split second synchronized by a particle based entanglement at a long distance, as the only solution for Schrödingers CAT. In both universes the both cats decide within a spilt second who is the observed and obsever cat (or who is the decaying radioactive atom). 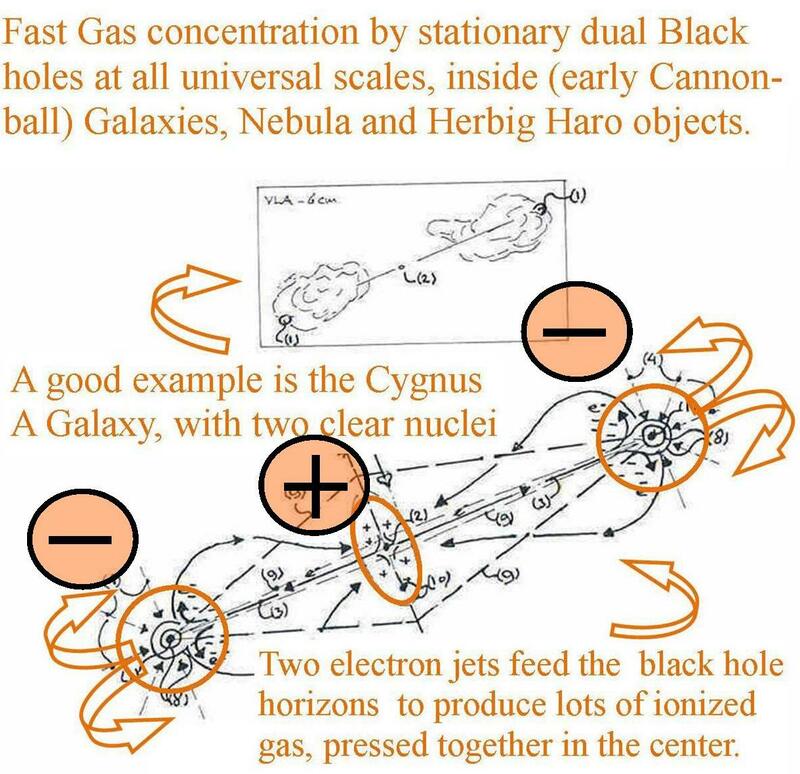 7: That each elementary particle resembles a pinball in an electric pinball machine which is driven by Higgs collisons. 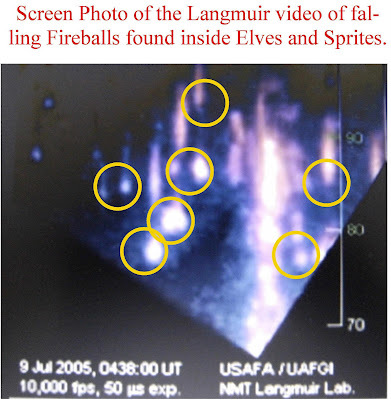 8: We count: Zero Point Energy Ball Lightning- micro Comets- Comets- Sunspots and other black holes. 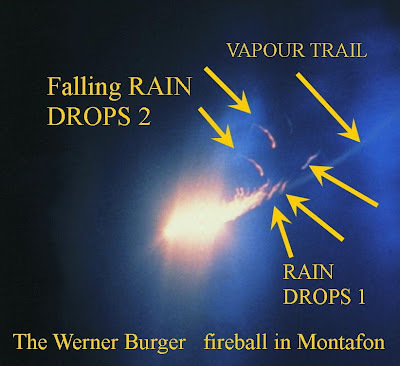 Photo of Fireball production by assumed X-Ray-EM interference. 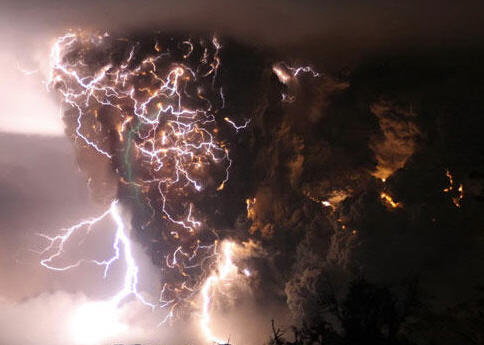 Photo taken through window with Canon automatic shutter camera during heavy thunderstorm. 3D reconstruction with two different perspectives. 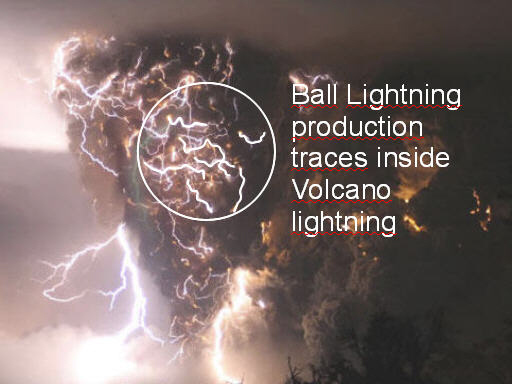 Are the former photos the key to understand how the configuration of EM fields should be to produce ball lightning? 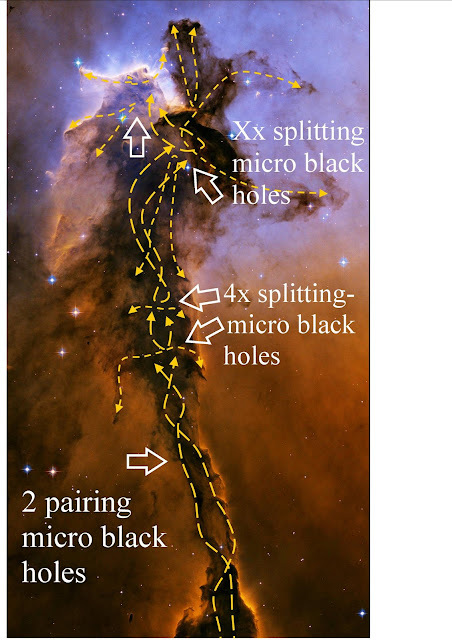 The Eagle/Spire Nebula Splitting and Pairing Micro Black Holes, pushed by Ion Tails. Cygnus A as a dual electron pump.